If Donald Cerrone wins by finish Saturday in Singapore, he’ll leave behind the rarified company of Anderson Silva and Vitor Belfort to sit alone atop the record books. A win would also mean the most in UFC history, and if you combine his tenure in the WEC, this will mark his 38th Octagon appearance. But Cerrone doesn’t care much for records, is far from retirement, and is still revered and feared enough to be called out by young prospects - the likes of which he’ll tangle with in the main event at Singapore Indoor Stadium. Unlike most previous opponents, Leon Edwards has succeeded in annoying Cerrone with his pre-fight antics. Instead of the affable, laid-back rancher, the Englishman has instead summoned the “pissed off” Cowboy, perhaps at his own peril. 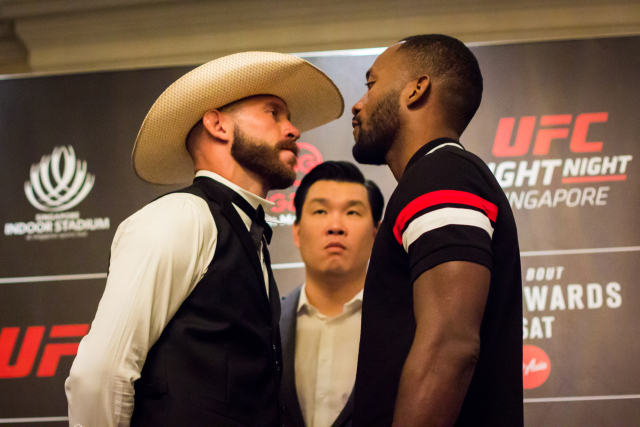 However when we caught up with Cerrone at Fight Night Singapore’s media day, he was suited in his finest western accoutrements and, characteristically, cool as a cucumber. UFC: You’re the guy who says you’ll fight anyone, anywhere. I guess since we’re speaking here in Singapore, it’s further evidence of that fact? DC: Yeah, absolutely. Anywhere: I’m happy they wanted me to come to Singapore. Anyone: the “who” never matters, just the date. I’m excited to be here and fight. I love it. UFC: It looks like you’ve been having a great time here in Singapore; you’ve been out on the water, out to amusement parks, having a couple beers. Is it better for you going into a fight to be relaxed? DC: I don’t know if it’s about being relaxed. I’ve just done this so long that I know what I like. I don’t need to sit in my room and worry and be frustrated or upset. I just enjoy life. I enjoy life every day. Why stop during fight week? I just go out and have a good time. Early mornings on the water. UFC: You were once in your opponent’s shoes: a young contender on a winning streak. What’s something he might not understand about where he’s at? DC: He doesn’t understand this sport. He’s trying to get under my skin, but it’s not going to happen. He’s trying to do the Colby Covington thing and just talk s***, but he’s not very good at it, so it’s alright. UFC: Also on this card is Tyson Pedro who you’ve spent some time with at Jackson-Wink MMA. What’s your impression of him? DC: I’m excited, man. I’m super pumped. He moves very well for a light heavyweight, and I’m excited to see him work. He came out to the ranch. Cool dude. UFC: You’re on the verge of having the most wins and the most finishes in UFC history. I bet you could have the record for the most records by the time you’re done. Tell us about your journey in the promotion. DC: Oh man, it’s been an unbelievable journey, just sitting back and looking at all the fights and all the places I’ve been. We’ve still got a long ways to go, man. A lot more Cowboy fights to witness and experience. S***, we’re doing good! UFC: Finally, when you close your eyes and think of the fight on Saturday, how do you see it going? DC: Oh, I’m knocking this kid out. This ol’ boy is going to teach him a lesson.